Manchester United host Chelsea at Old Trafford on Sunday where a win for the Red Devils could put six points between the two great rivals. Much of the focus will be on the two managers, neither of which will feel particularly confident given their recent league form. After a run of three draws over the Christmas period, Jose Mourinho’s United returned to winning ways in January with three much-needed results. Fantastic goals from Anthony Martial and Jesse Lingard ensured their first win of the calendar year against Everton at Goodison Park, before a 3-0 demolition of Stoke City instilled some confidence back at Old Trafford. Paul Pogba ran the show against Everton and Stoke, but since then has gone off the boil. Following a hard fought but well deserved 1-0 win at Burnley, United put in perhaps their worst performance of the season at Wembley in a 2-0 loss to Spurs. Pogba and several others were then benched the following week against Huddersfield, and a dull 2-0 win over the struggling Premier League newcomers did little to lift spirits. United’s 1-0 loss at Newcastle heaped more misery on Mourinho, and while much of the media focus remains on Paul Pogba, star signing Alexis Sanchez hasn’t exactly made the intended impact. The Chilean’s hesitation wasted a golden chance to give United the lead at St. James’, and his arrival seems to have had a negative effect on 22 year-old Anthony Martial. Chelsea won’t exactly feel full of confidence on Sunday either. The Londoners’ spirits will be lifted by their Champions League draw with Barcelona, but their recent Premier League form has been inconsistent to say the least. Draws against Arsenal and Leicester were put behind them with a 4-0 thrashing of Brighton, only for Conte’s men to capitulate at home to Bournemouth in a 3-0 defeat. A 4-1 drubbing at Watford only made matters worse, with Tiémoué Bakayoko getting sent off after just 30 minutes. The sensational Eden Hazard looked to have rescued a point for the Blues late on, but their defensive frailties were punished by a rampant Watford in a flurry of late goals. Hazard then found the net twice in a 3-0 home victory against West Brom. 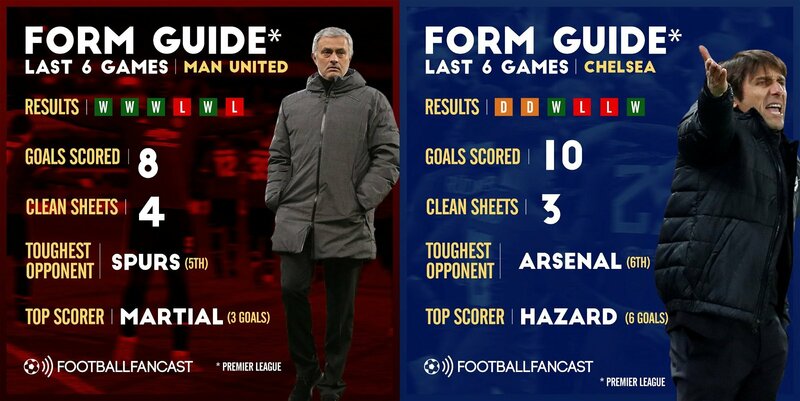 With both sides struggling for form, it’s likely to be a cagey affair at Old Trafford on Sunday, especially given the way both managers set up in big games. The onus may be on individuals to produce something out of nothing, and if recent form is anything to go by that individual will most likely be Hazard.